The Parametric Solid Modeling Projects (For Beginners and Advanced Users) is a parametric modeling book written to help users to learn and design real-world models. Structured in pedagogical sequence, the book contains real world engineering projects that begin with simple part assemblies and then progress toward designing complex industrial models. After completing this book, the students will be able to design other real world/Industrial projects with ease. Additionally, they will be able to design all components, develop assemblies, and generate 2D drawings of the parts and assemblies along with bill of material. 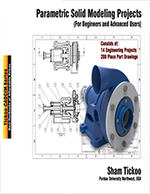 In this book, ANSI drafting standard have been followed. Consists of 14 projects that are organized in pedagogical sequence. Real-world mechanical engineering drawings used as projects. Project-based approach used for completing the projects and better understanding. Standard parts like Nuts, Bolts, Gears, Bearing, and so on are taken from the toolbox available in different CAD software (With ANSI standards).